London doesn't stop at Cockfosters, you know. The M25 and the border with Hertfordshire are a few miles to the north, across a number of surprisingly rural Green Belt valleys. London Loop section 17 explores this open space, across what remains of the royal deer park of Enfield Chase, from one side of the London borough of Enfield to the other. Enjoy the gap. It's an inauspicious start. A badly signposted footpath leads off from the station car park at Cockfosters, and if you've not got a map you'll likely be lost in minutes. But the meadows around Church Wood are a welcome sight, and from here on the greenery continues non-stop. It's not long before the Loop crosses the drive up to Trent Park, which I told you all about earlier in the week, and was the main reason I was out this way. But the official route skirts the perimeter, passing through Trent Country Park, and is secure from any future closure the sale of land hereabouts might bring. On a sunny day it's a busy spot, with couples snogging in the long grass and families playing by the ornamental lakes. Ahead is the first hill climb, a gentle ascent into Oak Wood, where a ring of murky water lurks in the trees near the summit. 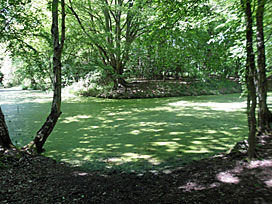 This is Camlet Moat (pictured), a medieval earthwork which may have surrounded a hunting lodge or may be purely ornamental. A little further along (but off the official path) is a more obvious monument, a tall stone obelisk, brought here in the 1930s to celebrate the honeymoon of the Duke and Duchess of Kent. And then things get much much quieter. Across the summit road lies the valley of the Salmon's Brook, almost entirely undeveloped and given over fully to agriculture. The land's council-owned, and currently home to fields of mostly ripening wheat. The path descends swiftly to the river, which is nothing special, but lined (at present) by a marvellous display of hawthorn blossom. Spend a mile or so following the brook, not that you can really see it, and admire the buttercups bringing a blaze of yellow to the meadowed slopes [photo]. So away from it all is this landscape that the occasional double decker red bus on the ridge is the only hint you're not in the middle of the countryside. These streams run west to east in parallel fingers, and there's another ascent and descent to reach the next. On the way you'll pass through Brooke Wood, planted in honour of a local councillor 20 years ago, and already a densely shaded habitat. Near the stile on Cuckolds Hill there's a brief view directly into central London. That's the tiny Shard cluster over there, and that's the BT Tower far far further across the horizon than you'd ever expect. 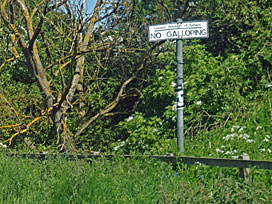 Down a long track you pass through Rectory Farm, with its clay pigeon shooting business, and which has probably the only "No Galloping" sign in the whole of London. The stream here is the Turkey Brook, which the Loop then roughly follows all the way down to the Lea. Then beneath the railway, absolutely nothing impressive, to touch the edge of civilisation again. There are several greenhouses hereabouts, part of the horticultural cluster around Crews Hill. There's a cricket pitch to circumnavigate, where gents in white might be taking an entire day of ball-chucking terribly terribly seriously. And there's a marvellous park - Hilly Fields Park - which is a municipal treat for residents fortunate to live round about. The Turkey Brook is at its heart, much more scenic now, wiggling and meandering in lengthy shoals. Step off the tarmac path beneath a canopy of oaks to enjoy the pebbled shallows, or to let your dog get splashingly wet (if you've brought one with you). I'd say the enclosed grassy slopes of Hilly Fields Park exude a genuine charm that Queen Elizabeth Olympic Park can never hope to emulate. 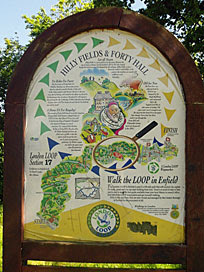 Near the Rose and Crown, at the entrance to the park, is one of the original London Loop signboards, erected before early funds for the project ran out. Across the road (a rare road, thus far) you'll stumble across original route of the New River, the artificial channel driven from Hertford to Islington, severed and empty. But you're still following the Turkey Brook, along the "Mile and a Quarter Footpath", where beer-chested men sit with rods in flagrant breach of the fishing close season. The path ignores Forty Hall, the most interesting old mansion round these parts, but there is a brief glimpse of its chimneypots across the grass. And eventually you reach Maidens Bridge, which legend says is where Sir Walter Raleigh laid down his cloak for Queen Elizabeth. No, if you've ever stood here, just no, this is more a narrow bridge with traffic lights kind of location. And that's the good bit over, sorry. The next passageway passes the New River proper, but it's buried. The A10 has to be crossed via a giant footbridge, which completely wrecks the rural ambience of the last seven miles. 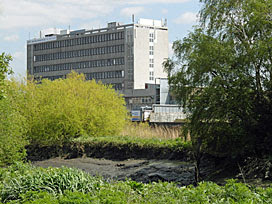 Alongside Turkey Street, the brook runs in a less than natural urban ditch. The main drag of Enfield Wash is a real shock, all takeaways and tanning salons, but thankfully the Loop turns swiftly left opposite the road where my Mum was born. You'll follow the Turkey Brook one last time along the northern edge of Albany Park, now a deep deep concrete channel to protect adjacent terraces from flooding, but still somehow a verdant home for wildlife. 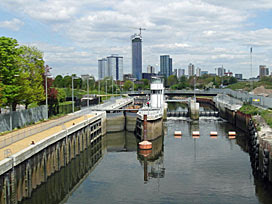 And at the railway line, that's it, the delights of Enfield Lock will have to wait for the start of section 18. The delights of Enfield Chase, however, will long remain. i) Start at the noticeboard opposite the library. There's a useful map here with all the sights worth seeing, which should help orientate you. If you're especially prepared you can print out the Millennium Walk leaflet before you arrive. And it's easy to fit all of this in before the next train arrives. ii) The tall building opposite is Budworth Hall, with its big clock added to commemorate Queen Victoria's Golden Jubilee. There are no such grand building projects for the Diamond Jubilee, alas, but there is a heck of a lot of bunting down Ongar High Street. Thieves nicked 30 metres of it last week, which made the front page of the local paper. The other 97% is still flapping patriotically. 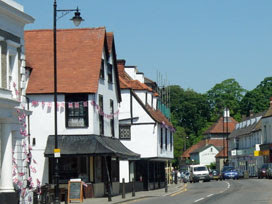 iii) The High Street's rather lovely, in a small town Essex way. It's wide and crooked, with an assortment of timber cottages and townhouses all the way down to the river. You probably don't have a Mr Grumpy's Old Fashioned Sweet Shop where you live, but Ongar does. Your local newsagent probably hasn't gone quite so monarchy-tastic in their window display as Senners of Ongar has. You probably don't have the choice of two proper butchers, in almost neighbouring shops, both open on a Sunday. Plus more pubs, and bijou boutiques, and a washeteria, and... Let's just say Mary Portas would adore the place. iv) Up a charming lane on the left is St Martin's, Ongar's church. It looks proper old, and indeed the belfry and parts of the roof are medieval. However, if you arrive during a christening service you're not going to get inside to take a proper look. Thankfully Ian did on our behalf. v) Make sure you walk down as far as the fire station, opposite which is a row of white weatherboarded cottages with a famous former resident. Explorer David Livingstone lived in the room marked with a plaque, above the passageway through to the United Reformed church. Livingstone Cottages, I presume. vi) Walk back up the hill and turn right into Castle Lane. A few houses up is a plaque to former resident Jane Taylor, who's one of the most famous poets you've never heard of. She wrote the words to Twinkle Twinkle Little Star, some say here, and is buried in the churchyard over the road. vii) And finally, if you carry on into the field along the footpath, here's Chipping Ongar Castle. Don't get your hopes up. It's a motte and bailey, of which only the high mound is visible, and that not very clearly through the surrounding trees. A moated ditch still offers protection, as does a large fence. Best viewed, so I'm told, during the winter. And hey presto, at the end of the path, you're back at the library again. If you have a spare hour, you should definitely take a walk to Greensted Church. Walk past Ongar Sainsbury's, across the river, then straight across the next field and keep going through the trees. It's only a mile, and if you time it right you might even spot a steam engine puffing across the horizon. You won't spot the church at Greensted-juxta-Ongar until you're almost on top of it, tucked away in its compact churchyard, all fresh-mown and floral. But the building is unexpected, being made almost entirely of wood. 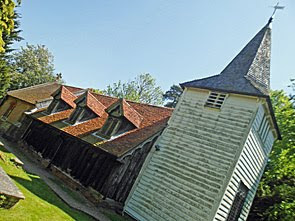 It's the oldest wooden church in the world, which is pretty damned impressive really for a backwoods hamlet in Essex [upright photo]. It's "Stave Built", including 51 chunky vertical timber planks dating from before the Battle of Hastings, which you'll see best if you walk round the back. Look closer and you'll see a lot of the other beams are more recently restored, but never mind that, it's lovely. Yes, you can go inside every day of the year, which is how churches ought to be, although it's a risky stance to take. A photo on the wall shows the 16th century painting stolen from here back in January, on a Sunday afternoon no less, carefully unscrewed from the wall and wandered off with. Visitors should walk off with jams and chutneys instead - the back of the church is almost market-like, with a wide variety of reasonably priced hand-made preserves on sale. I went for the lemon and lime curd, which I can confirm is gorgeous, although a closer look at the label reveals it comes from an estate in Leicestershire. As for the church's interior, that's a bit dark, with illumination coming through stained glass in small dormer windows. The pews are narrow and lockable, the chancel is compact, the beams overhead are proper oak, and it's all just very wonderfully woody. For a proper report, and sharp people-free photos, go and read what Ian's written. Or better still, pay a pilgrimage yourself. In case you're thinking of visiting the Epping Ongar Railway, here's where, how much, what and when. ≠ Sat 24 June: It's the Ongar Carnival! Ongar doesn't get thrillinger than this. 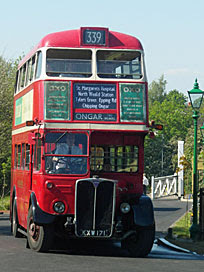 ≠ Sun 1 July: It's the North Weald Bus Rally! Not on site but close by at the airfield, entry £9 (with linking buses). ≠ Sat 7 July: It's Olympic Torch Day! Except the torch drives by in convoy before 7am, and the first train isn't until 10:30. ≠ August Bank Holiday: It's the Big Steam Up gala weekend! There will be mixed traffic. ≠ Sun 16 Sep: It's Railwalk Sunday! With guided walks through the surrounding counytryside. ≠ Last weekend in September: It's End of the Tube! Celebrate the anniversary of tube shutdown in 1994. They closed the line to Ongar in 1994. Many are amazed it lasted that long. A single track shuttle from Epping, with trains at peak hours only, serving a town of only six thousand inhabitants at the far end. Whatever the Central line was doing stretching this far into Essex, it was hard to tell. Funding and footfall were the problems. The shuttle ran entirely outside the capital so London Transport wouldn't subsidise it, so the service dropped to levels that weren't reliable, so Ongarians didn't use it. The town's been without a proper rail service for the last eighteen years. 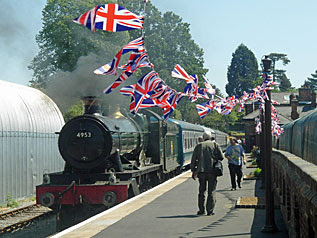 Until this last weekend, that is, when the Epping Ongar Railway celebrated its grand reopening. They opened the line to Ongar in 1865. It wasn't part of the Central line in those days, but a branch line of the Great Eastern Railway. An extension from Loughton brought the railway into the heart of rural Essex, with trains from Ongar running overground all the way to Liverpool Street [map]. Only when the Central line was tunnelled out to Leytonstone did London Transport take over - that was in the late 1940s - which was also when the Epping to Ongar stretch was curtailed to a separate service. Steam trains (contracted out to British Rail) continued to run until 1957, when the more familiar electric trains started their lonely journeys. And it's to this former golden age of steam that the new heritage railway returns. You'll find no mention of the tube - no roundels, no hints of journeys to West Ruislip - the whole thing's done with proper trains. The Epping Ongar Railway comprises a fine band of dozens of volunteers, and they've been toiling away for years to get the line open. They've not managed it all yet. 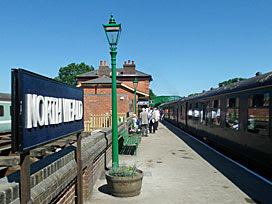 Trains run only between North Weald and Ongar, a distance of about five miles, plus a shuttle west to Coopersale and straight back again. There's no link yet at Epping [photo], where the tracks beyond the Central line buffers remain overgrown and unused [photo]. A new platform is planned, maybe, one day, in an ideal world, if funding permits. It'd transform the nature of the attraction if EOR trains were properly linked to the tube network, making it much easier for Londoners to make their way out here. In the meantime they're using heritage buses to transport passengers from Epping station to North Weald, and then pick up the trains from there. The bus in question is the 339, a former London Country service that used to run parallel to the railway [photo]. Tickets didn't used to cost £17.50, but for that you get unlimited bus and train rides for the day anywhere between here and Ongar, and a proper cardboard ticket just like in the old days. A number of the passengers on my bus were grandparents taking their grandkids for a grand day out, and they were having to explain patiently what a bus conductor did, and why he had to ding the bell when it was time to set off. The RT drew admiring glances as it rolled through Epping's streets. Sunday buses round here are normally infrequent modern cuboids with electronic displays, so the appearance of a 'proper' bus made many an elder resident stare. Mums halted their pushchairs to watch us pass, even kids on bikes did a sudden doubletake. Only the patrons of Costa Coffee in the High Street seemed immune, sipping and chatting on the front terrace entirely unmoved, but that's Essex car culture for you. The closest platform is for the shuttle service to Coopersale [photo]. This is the lesser of the two services, to be frank, but you need to ride it for your moneysworth. A diesel combo pulls out every half hour hauling a motley collection of old-ish carriages. Some Inter City stock, some compartmentalised first class, nothing like you'd normally travel in these days and all the better for it. It's not going to be a long journey, and you won't be getting out at the other end, this is just a brief run a couple of miles closer to Epping and back. The train runs past the Epping Forest Woodland Burial Ground, where mourners must have thought their loved ones would be interred in peace but now face steam and whistles four times an hour every weekend for the rest of the year. The train dips beneath the M11, the walls under the bridge brightly graffitied, then comes to a halt in the trees just before the Coopersale bridge. There is nothing to see, bar a few rooftops and the hint of someone's messy back garden. A short pause, a pair of whistles, and time to shunt back again. If the steam train's in on platform 2, the diesel waits patiently before crawling back into platform 1 [photo]. I'm not sure it's usual practice but there was a bloke up the top of the signal on Sunday, either lifting the bar manually or struggling with a black plastic sheet, it was hard to be sure [photo] [photo]. It's a fun job if you can get it, no doubt, for anyone who fancies spending their weekend getting greasy in hi-vis overalls. 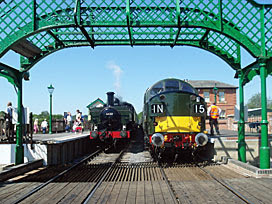 Job done, the diesel eases in past the station building drawing to a halt by the footbridge [photo]. And look, I'm sorry I've written all this and still not got round to describing the main event, which is the long ride out to Ongar. But tomorrow, honest, and in the meantime you might like to spoil the surprise by ploughing through all my photos if you haven't already. London has more stately-type homes than you might think. Some are still very stately. Some have been thrown open to the public. And some now perform a completely different function. 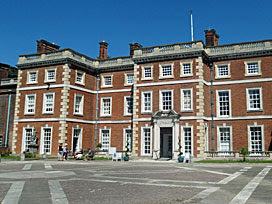 Such is the case at Trent Park, a mansion in deepest Enfield parkland just to the north of Cockfosters. It started out as a hunting lodge, grew into a grand house and eventually mutated into a teacher training college. Today it's part of Middlesex University, the campus where all the arty drama students hang out. But at the end of July they're all moving out, as the university "rationalises its property portfolio", so this summer's the grand finale. In celebration Trent Park is throwing open its doors for a series of Open House weekends, some of which you've missed, and one of which is this weekend. It's a bit of a trek to reach, as university campuses go. 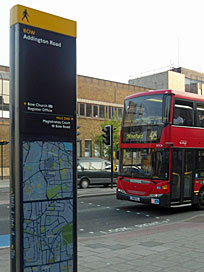 Cockfosters and Oakwood stations are both closest, if close is the word, although the university runs a minibus from the latter to rest students' legs. I walked from the former, up a long avenue of lime trees, through the grounds of the local country park. The squealing I could hear in the woods turned out to be safety-harnessed youth swinging from a Go-Ape zipwire, while their parents chilled out at the cafe up the drive. The view to the north is gorgeous, a rolling haymeadow speckled with buttercups dipping down to an unseen stream with verdant slopes beyond. In heatwave conditions the grounds are ideal for a stroll or a slouch, and it's easy to see why the rich and famous might have wanted a close-to-London bolthole here. The area hereabouts, and for miles beyond, used to be part of an enormous woodland called Enfield Chase. George III partitioned it off and gave this chunk to his royal physician as quite an ostentatious way of saying thanks. The house started off small, then subsequent owners added extra wings and ornamental gardens, often bankrupting themselves in the process. The penultimate owner was Sir Philip Sassoon, MP and socialite, who became immensely rich on the death of his father in 1912. 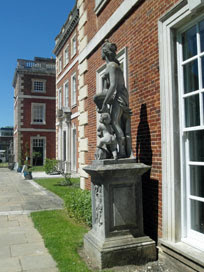 He cheated hugely by rescuing doors and windows from the demolition of a grand house in Piccadilly, and using them to reface the exterior of Trent Park classical style. A visit to Sir Philip's estate was always a glittering affair. You'd have enjoyed sumptuous cuisine. You might have bumped into George Bernard Shaw or Charlie Chaplin on the terrace. There were penguins in the ornamental lake. Even the deer had gilded antlers so they looked good from a distance. We heard all about such fripperies on the Open House tour of the house. Once round the ground floor and then, if you waited really (really) patiently, down into the cellars too. One of the students took us round, all genned up and providing a most professional presentation. 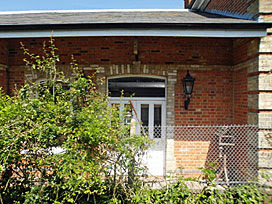 He pointed out the original front of the house, now the rear wall at the front of reception. He pointed out the bedrooms where Edward and Mrs Simpson stayed, separately allegedly, in the years when their relationship was a clandestine affair. He pointed out the obelisk on the hill opposite, seemingly ancient but imported specially in 1934 for the honeymoon of the Duke and Duchess of Kent (it lined up perfectly with their bedroom). And he pointed out the room in the basement where German-speaking spies listened in on conversations in the rooms above when this became a prison camp for captured WW2 officers. It's had a quite a history, this place. The ambience was deftly augmented by the subtle appearance of further drama students in period costume, representing former inhabitants, wafting around between the rooms. One in a wig, then three ladies engaged in a deportment class - a very nice touch. But it was a little bit strange being taken on a tour of a mansion that's a university because all the rooms now have very different functions. The main saloon has a clunky overhead projector attached to one wall. A stack of municipal plastic chairs are stacked up next to a priceless fireplace. There are music stands lurking in the front porch. A long-abandoned stationery shop lurks in a messy alcove in the cellar. A nasty 1970s annexe has been tacked onto one wing. But much of Sassoon's sense of showmanship survives. After today two more Open House weekends are scheduled. One's the 23rd and 24th of June, and the last is the opening weekend of the Olympics, if you're looking for somewhere entirely non-sporting to escape to. And then the students move on and the staff move out, which must be gutting, given the alternative accommodation is a purpose-built campus in Hendon. It has no rolling haymeadows, no Japanese Water Garden, no outdoor pool and no room once painted by Winston Churchill. Instead the entire fifteen thousand square metre estate is up for sale, which'll make the university a tidy profit, such is austerity funding. There are no clues yet as to who'll buy the place up. Enfield council's hoping for a major educational or institutional use, but my money's on a very very posh hotel. 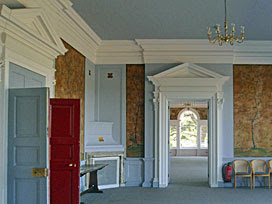 The place was used for entertaining before it was a college, and could easily slip back into luxury spa experience mode. So if you want to see historic Trent Park, get down sharpish, else you can always wait three years and come back for cocktails. I thought I'd go back and look at the Twelvetrees gasometers closer up. You can't get right up close from Three Mills, you have to start on the Blackwall Tunnel Approach Road. Follow Twelvetrees Crescent over the river and past the barrier into the business park (it says private no entry, but stuff that, you're not a car). There on the left, past a pipe-packed British Gas facility, you can't miss them. Seven in total, tightly bunched, doing not much except standing around looking gorgeous. They don't make energy-storage infrastructure like this any more [photo]. Tall and imposing, with metalwork manufactured far more intricately than necessary because that was the Victorian way. They were erected between 1872 and 1878 on behalf of the Gas Light and Coke Company, London's 19th century equivalent of British Gas. The surrounds are all made of cast iron, while the central telescoping drums are all made of steel. Viewed up close you can see the connecting bands are decorated - a different repeating pattern on each storey [photo]. If you want to stand alongside and sound knowledgeable, you should point out that the lower part of each column is Doric, while the upper part is simplified Ionic. They're a set of gasholders with genuine classical influences - Boris would be so very proud. Gasholders aren't the modern way, and now only those that have been listed (like these seven) are likely to survive. There are plans afoot to add a visitor attraction here, to make the gasholders some sort of sports facility destination, but these appear to have stalled on the drawing board about two years back. Certainly there's no current sign of access being granted, artificial sports pitches being laid or well-meaning ladies with clipboards handing round questionnaires about sustainability. And hurrah for that. Standing here in the evening sunlight, admiring the maze of columns and ladders, it's hard not to be impressed with this lot just the way they are. 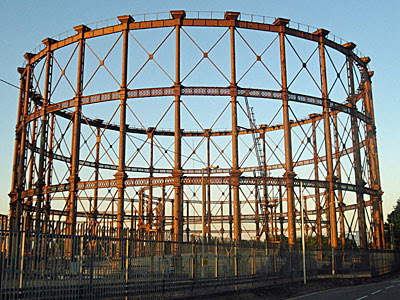 A list of London's gasholders: Battersea, Beckton, Bromley, Bromley-by-Bow, Cambridge Heath, Edmonton, Fulham, Kennington, Kings Cross, Kingston, Ladbroke Grove, Lower Sydenham, Mitcham, Motspur Park, New Barnet, New Southgate, North Greenwich, Romford, Rotherhithe, Southall, Tottenham, Wood Green. help me out with this! Immediately across the road from the Twelvetrees gasholders, hidden from view by a shield of trees, lies a secret garden. I say secret, even though it's shown on maps and everything, because I've somehow never known it existed despite living less than a mile away. The path's not signposted or anything, neither is it obvious from the 323 bus stop that anything this intriguing might lurk within a clearing in the trees. It's a war memorial, a war memorial in three parts. On the left is a domed pergola, clearly intended for trailing plants, but any such foliage is long gone. In the centre is a large plaque, rather bolder than those on either side, etched with the names of a hundred or so fallen men. And on the right, blimey, it's a memorial gas lamp. An ornate octagonal iron casing sits on a tall white column, topped off with spikes and crown-like flourishes. And within the glass, 24 hours a day, a gas ring burns. There must be a dozen or so vents, and if you watch carefully you can see the gas gently flickering as it burns in permanent memory. Across the grass, unseen by any casual passer-by, is a statue of a kindly-looking gowned man. You'd think might be nationally important, but he turns out "only" to be Sir Corbet Woodall, Governor of the Gas Light and Coke Company during the Great War. Industrialists merited their own statuary back then, not that anybody seems to care today. Indeed the building down by the road used to be the London Gas Museum - yes there really was such a thing - but that was closed over ten years ago and the exhibits dispersed elsewhere. The surrounding area may now have become a bland business park full of cavernous warehouses, but at least the company's gasholders still stand as a fitting reminder of the capital's industrial past. Not every path near the Olympic Park area is being closed off. In an unexpected reversal of fortune, one path that's been closed off for the last five years has recently been reopened. That's the footpath along the edge of Abbey Creek, a minor backwater between the Greenway and Three Mills. It's less than half a mile long, but by golly it's packed with interest. If you're in the area this summer, and they haven't closed it off again, this might make an interesting ten minute diversion. Look for the snail. 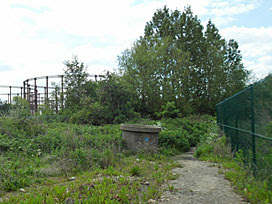 That graffitied metal spiral nestling in the undergrowth off the Greenway is actually a chunk of redundant pumping machinery from Abbey Mills nextdoor [photo]. This is where the path turns off, two paths in fact, one high and one low. Ignore the upper past the perimeter of the Pumping Station and fork left down to an unlikely seating area. I say unlikely because there's hardly a glorious view. Sit on the benches and you can look out over a concrete office block, or if the tide's out a tyre-strewn expanse of mud. On a good day there might be birds that aren't seagulls flapping in the reeds, on a bad day, well, that could be very bad indeed. A row of fourteen outfall pipes emerge immediately beneath your feet, used in emergencies to disgorge raw sewage into the river system of the Lower Lea valley [photo]. In an average year 16 million tonnes of the stuff escape here, which is why Thames Water are currently digging London's deepest ever tunnel to divert the discharge to Beckton. More of this later. But suddenly the way is blocked, the path overgrown. There's been subsidence, crumbling or something, which is technically the reason this route's been sealed off these last five years. But rejoice because a detour's been driven through the hedge into the neighbouring field, and this is a very special field indeed. It might look like a building site, and most of it now is, but a dozen years ago this was the site of the very first Big Brother house. Craig, Nasty Nick and Brian, they all lived in a makeshift Channel 4 prefab on the site, with cameras and excitable Davinas all around. A fence blocks off the majority of the space, behind which are diggers and machinery and obscuring piles of earth [photo]. The eviction walkway used to run along here, not quite the part accessible today, but still closer to the action than by rights ought to be the case. Live broadcasting was often interrupted, back in 2000 and 2001, by loudmouth viewers yelling secrets from the public right of way along the water's edge. It's one of the reasons the show moved to Borehamwood, this inescapable lack of East End privacy. But that path's subsidence means public access now encroaches for a hundred metres or so into a patch of overgrown wasteland where television history was made. No plaque is evident, nor ever will be. There used to be a low footbridge here, nothing special, that is until Davina McCall arrived. This was the bridge early Big Brother evictees crossed, a staple of Friday night TV, where the media waited with cameras poised to grab a flashlit snap of disappointment. You'd know it if you saw it... but now you'll never get the chance. The footbridge was removed to provide headroom for lock-bound traffic, and has now been replaced by a much taller footbridge in approximately the same position [photo]. It's utterly charmless, with cheap-feeling bouncy staircases, but it does provide a much better vantage point from which to gawp down on the surrounding area. Look at that, the Big Brother field is now almost entirely wiped away, razed and ready for the construction of the Lee Tunnel [photo]. If the even more expensive Tideway Tunnel is ever built (beneath the Thames from Acton), that'll most likely end right here in Marjorie the chicken's henhouse. On the far bank, that's Three Mills Studios. As well as BB's studio interviews, many's the TV show or movie that's been filmed within its security perimeter. 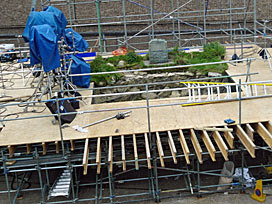 They sometimes store props round the back, which can be seen fairly clearly from up on the bridge. 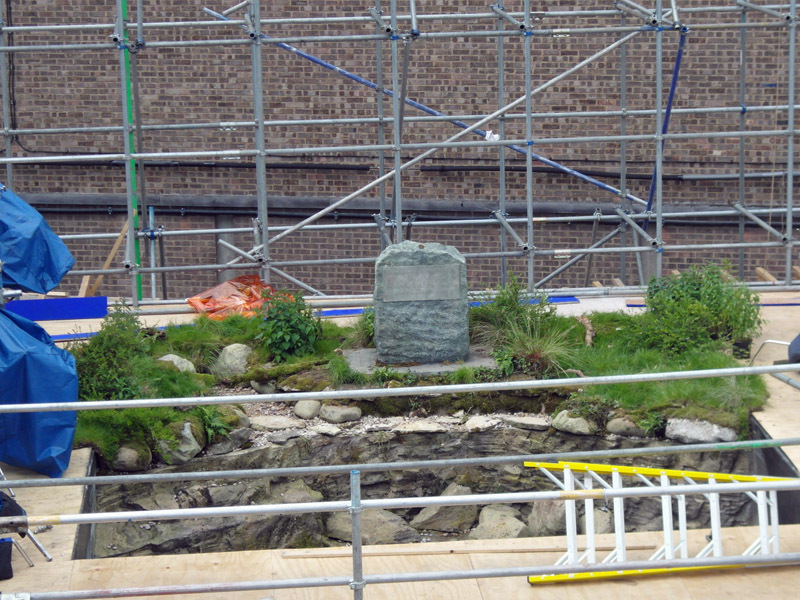 On my most recent trip I was intrigued to see a headstone-style chunk of fibreglass set in the middle of a grassy platform supported by scaffolding. The inscription remained a mystery until a judicious zoom revealed unexpected wording: "This stone was placed here to mark the source of the River Thames". But that's nearly 200 miles away! It seems someone's built a perfect replica of a famous monument from a Gloucestershire field, in portable form, complete with rocky space in front (from which a water feature might gush) [close-up]. Completely coincidentally, I'm sure, hundreds of LOCOG staff are busy preparing for the Olympic Opening Ceremony at Three Mills at the moment. I wonder where this very British prop might pop up next. You can't turn left to walk the next bit, around the waterside edge of Three Mills Studios. That's also been sealed off for five years, quoting instability as the reason, and nobody seems to have any impetus whatsoever to open the route back up. But you can turn right past the backlot, past the lock gates, up to Three Mills Green. And that's the end of this "couldn't do it since 2007, can do it now" walk. Ten minutes tops, but so much of interest packed in along the way. I've missed it. We're getting new signs along Bow Road. Not for road traffic, not even for cyclists, but for us pedestrians up on the pavement. This is the latest rollout of the Legible London project, first seen only in the centre of town, but now increasingly evident in the outer suburbs. Bow Road's been specially targeted, apparently, because of you know what. With the world watching London in the summer of 2012, we're working with Tower Hamlets to introduce our Legible London maps and signs around Bow Road. It'll help visitors walking to the Olympic Park during the Olympic and Paralympic Games. Which is interesting, because none of the recommended travel routes for getting to the Games involve using Bow Road. None of the stations hereabouts are designated venue stations, and you can't get to the Olympic Park without crossing the human-crushing Bow Roundabout. You might walk this way if you were local, you might walk this way if you were lost, you might walk this way if the rest of the transport network had shut down, but probably not otherwise. Whatever, whichever, the signs are a great thing to have. Even without the Games, this part of East London is busy. It's home to a major hospital, a university, two Tube stations, a DLR station and two large parks. So Legible London will improve pedestrian signing both for now and for the future. There is no major hospital on Bow Road. There used to be, but it's been closed for seven years and is about to be turned into flats. There are major hospitals much further down the A11, but they're not on Bow Road. Neither is there a university, technically there's only one tube station, and even the large parks are some walk away. Presumably someone's chosen to use the phrase "around Bow Road" in a vague arbitrary woolly neighbourhood sort of way. You might not want to put such a person in charge of wayfinding and mapmaking. It coincides with the Barclays Cycle Hire scheme moving into the area, and this will make Legible London even more useful across the borough. We plan to have these Legible London maps and signs in place by Christmas 2011. The tall enamel maps appeared couple of months ago, but the sign outside Thames Magistrates Court only went up on Monday. Merry Christmas everybody. Never mind if it's a bit late, Bow Road's very pleased to be becoming more accessible. And if this investment stops yet another lost soul asking me how to walk between the tube station and the DLR, it'll be job well done. It may happen, one day, that you find yourself beyond Norwich in the watery bit of East Anglia in need of somewhere to visit. 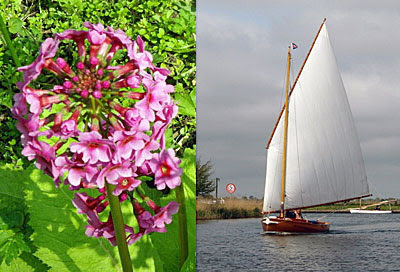 It may happen that you fancy somewhere gentle, with greenery and floral bits, and the possibility of a boat ride later. In which (very specific) case, I can wholeheartedly recommend a trip to the Fairhaven Water Gardens - a historic aristocratic playground now thrown open to the public. Access is up a lane beyond South Walsham village, then you park up in a field and walk down to the gift shop. Just over a fiver gets you inside, past the plant stall, with all areas fully wheelchair accessible. They stick a board out the front to let you know what's in flower. Rhododendrons and azaleas are big at the moment, but especially special are the candelabra primula. These damp-loving plants are lovely - concentric rosettes of blooms on long stalks in a variety of shades of pink. Here they're to be found clustered along the edge of various artificial waterways, seemingly very special at first, then eventually so commonplace as to make sightings almost blasé. The Gardens, and especially the primula, attract Norfolk's photographers in number, which sometimes leads to polite queueing at favoured sunlit spots. Most twisting walks lead to the shores of South Walsham Inner Broad, where a regular tourist boat service chugs off from a pier beside a thatched boathouse [semi-pretty photo]. Most trips are brief, out to the next broad and back, but twice a day Captain John steers the launch much further up the Fleet Dyke as far as the River Bure. Past yachts and cruisers, past lads beering it up, past retired couples sailing into the wind. Past swans and herons, past gaggles of geese, past grebes and whatever baby grebes are called (other than aww, cute). To St Benet's Abbey, formerly one of the most important religious sites in East Anglia, now razed and ruined (apart from a scaffolded gatehouse). The land is reeded and marshy, far from any road, yet still abuzz with relentless river traffic [pretty photo]. As getting away from it all goes, you can't beat a broad. If you fancy proper Olympic tickets, even if you've never ever applied for any before, and you're at your keyboard at 11am this morning, what's available? These are the leftovers after people with no tickets nipped in last week, so don't expect anything amazing. But plenty of expensive tickets remain, plus a few bargains if you know where to look. An overview has been published dividing the sports into good, low and no availability, but this needs to be read in conjunction with the press release to make full sense of the data. Rule 1: You can purchase up to 4 tickets per session. Rule 2: You can purchase up to 4 sessions. Rule 3: ...unless you fancy football tickets, in which case you can buy at least 20 tickets, maybe 30, because they're increasingly desperate to shift these. 1) Basketball, Diving, Handball, Hockey: You'll have to be quick to get them, but these are the last £20 tickets for an event in the Olympic Park. 2) Archery: They're not playing cricket at Lords, they're firing arrows. That'd be different. A few £20 tickets remain. 3) Boxing, Fencing, Judo, Table Tennis, Taekwondo, Weightlifting, Wrestling: OK, so these are at ExCel, probably the least exciting of all London's Olympic venues. But £20 lets you watch some sports you'd probably never see otherwise. 4) Volleyball: Earl's Court's being knocked down after this, probably. Last chance to see. 5) Olympic Day Pass: There aren't many of these. They're only available for Monday 30 July to Thursday 2nd August, which is before the Athletics starts. You don't get to watch any events. But you do get five hours to wander around inside the Park, which is huge, and you'll remember that for the rest of your life. Ten quid gets you in. If you hurry. 6) Paralympics Games: World class athletics, dead cheap tickets, massive availability... just click onto the other tab, and you can snap up almost whatever you want. Rule 5: ... but you can't find out which sessions have cheap tickets available until 11am. Rule 6: Be patient. You may get stuck in Ticketmaster's churning queue for up to 30 minutes. Rule 7: The longer you wait, the less will be left. We arrive early. The theatre has its own restaurant attached, tonight with a specially themed menu, so a pre-performance dinner has been booked. Prawn cocktail, obviously, then chicken Kiev, what else, and finally chocolate fondue. It's the only way to kick off a seminal Seventies evening, and the cuisine is as gloriously mainstream as you'd hope. The crowd assembles in the bar, its walls lined with posters from past glories hereabouts. There's even one couple we know, and haven't seen in years, so we say hello while we wait to file in. The theatre is compact, little more than a few raked benches squished in front of a low stage. The set is perfectly dressed - a symphony in browns and oranges, from the tacky ornaments on the rear bookcase to the disturbingly floral wallpaper. Even the rippled glasses lined up on the coffee table, almost certainly free gifts from the local petrol station, are just like my living room used to have. We shuffle along a rear bench, squeezed in between fifty-somethings and trendy youths who couldn't possibly remember this from first time round. And when Donna Summer is finally switched on, we're off. That woman who used to be that bloke's wife in that soap opera hogs the stage. She wafts around the set in a lime green dress, daring the audience to accept her in place of the iconic actress who made the role famous. It takes a while, but with force of personality (and a knowing smirk) she soon succeeds. That woman from that never-ending BBC3 sitcom, she's the less confident neighbour, you know the one. She plays her part with goofy aplomb and straight-faced understatement, earning many a laugh from the audience. And the lady who's the posh neighbour, once I've wiped her many TV drama performances from my mind, brings the awkwardness of her character completely to life. Elsewhere on the sofas a considerable amount of facial hair is on show, but that seems somehow normal because male grooming has come full circle since 1977. We all of us know all of the words. When the "cheesy pineapple one" appears, we're mouthing along. When the first "little top-up" is offered, we know several more are on their way. And when Demis Roussos lights up the record player, we grin in anticipation of what's coming next. The tray of cheesy pineapple ones proves irresistible to one member of the audience who slips one off the coffee table on his way out at the interval. We spend twenty minutes or so in the bar downing wines and cocktails far superior to anything the suburban partygoers might be sipping on stage. Then, before the second half begins, a stage hand nips out and politely harangues the audience. "Please don't eat the props. You know who you are." We arrive early. A few of the cast are wandering around in the car park, taking the air before the curtain goes up. There are no soap stars here, and nobody hassling for autographs. The audience is slow to arrive, filling up seats at the front of the hall and leaving rather a lot free at the rear. Tickets have been available at the village shop for weeks, but Saturday night TV appears to have won out. Punters below the age of sixty are rare, below forty almost non-existent. Programmes are free, although donations are requested, and raffle ticket purchase is encouraged. The kitchen doubles up as the bar, serving canned beer for two quid and shandy for one. Grab your glasses, we're about to begin. A cable strung across the fire exit powers the speakers with some introductory music. The lights go up - new lights, of which the village hall committee are very proud. And then the actors are on, diving into the fast-learned script with comic timing. The play's a strange one, and not from Ayckbourn's inner repertoire. This is good, because the evening will be a proper voyage of discovery for almost the entire audience. Only the prompter in the front row has seen it through before, and they'll only be needed twice when a slight pause threatens to become a hiatus. The scenery's been kept simple, as suits best for a limited run, and it's no surprise (for Ayckbourn) when a bed makes repeated appearances. I know none of these actors because I'm a stranger here, but to locals these are familiar faces. They all had different roles in the pantomime, remember, and different again in the serious play they did last year. Today they're doctors and technicians and disabled media moguls precisely as the script demands, the parts shared out in line with talent and bodies of best fit. Some have minor roles, cameos even, requiring a quick change between scenes to walk on again as somebody new. Others have the major parts, a considerably more taxing requirement, yet memorised and delivered as well as might ever be hoped for. During the interval, the audience takes the opportunity to socialise. Unlike the West End where everyone's a stranger, here everyone knows the councillor, the newsletter editor and the lady from down the lane. Chatter is curtailed so that the raffle can be drawn. It wouldn't be a Norfolk community event without a raffle - the most acceptable means hereabouts for recycling unwanted gifts to a worthy cause. Everyone perused the prizes on the table on their way in, and is now hoping that their coloured strip of tickets might win them their favoured choice. The basket of fruit goes first, then the bottle of whisky, and even the gift pack of foot scrub goes earlier than might have been expected. Only when the last ticket has been drawn, and the final bottle claimed, can the second half continue. The scenes run faster now, with quicker changes, tightly honed. The pace hots up to a frenetic conclusion, yet still providing food for thought rather than belly laughs. And then it's all over, with only a single brief curtain call for the audience to show its genuine appreciation. There'll be no West End run, but why travel that far when there's a talented troupe on your doorstep? If you didn't get tickets to the men's 100m final and are angry about it, you probably have very little understanding of the laws of probability. But if you didn't get any tickets to the Games at all, or did but fancy some more, then this is the week to take action. More than a million tickets will be available, most for the Paralympics rather than the Olympics, but still providing plenty of opportunity to get inside a venue and lap up the atmosphere. If you're still whingeing next week, either your cash reserves are too low or your expectations are too high. Paralympic leftovers: Over a million tickets go on sale this morning at 11am. That's not great if you're at work in a non-internet environment but, this being the Paralympics, it's very unlikely that events will sell out really quickly. No specific details of session availability will be made available in advance, so you'll have to dig around on www.tickets.london2012.com to discover precisely what's available and at what price. But expect tickets to start at only £10, in a variety of events, with the greatest availability in Athletics. Yes, Athletics. If you fancy a trip inside the Olympic Park and inside the Olympic Stadium, then Paralympic Athletics is your golden ticket. Other venues in the Park with decent availability include the Aquatic Centre (yes, honest, for Swimming) and the Basketball Arena. Even the Opening and Closing Ceremonies have half-decent availability, although maybe at a price. The Paralympic Closing Ceremony is essentially a dressed-up Coldplay concert, if that's of any interest. At the other end of the availability scale, the Archery and Shooting in Woolwich are almost sold out already. At only £10 a ticket, these might well be events to target at 10:59am this morning before they all disappear. Also at only £10, day passes (with sport) will be available for the Olympic Park or for ExCel, which may be well worth considering. The full availability summary is here. Don't be sniffy, grab yourself a bargain. Olympic leftovers: These go on sale this Wednesday at 11am. They're the same tickets that were available last week to ticketless applicants, or at least all of those that haven't yet sold out. Expect most of the leftovers to be in the expensive price brackets (for example no Athletics tickets below £400), or to be in Football (which not enough people genuinely care about). Again it's first come first served, and open to anyone, so best get in fast. Fresh Olympic tickets: The following go on sale next Tuesday 29th May at 11am. a) Cycling Road Race: £15 or £10 gets you into special enclosures either at Box Hill or at Hampton Court. Or it's free (and ticketless) everywhere else between here and The Mall. b) Tennis: £10 gets you onto Henman Hill to watch Olympic matches on a big screen. c) Orbit: If you have a ticket to the Olympic Park, and only if, you can buy an ticket up the big red observation tower for £15. Tickets will probably be for a specific time on your particular day, but that's not yet confirmed. At least there'll be something decent to see from the observation deck this summer, which may not be the case when the tower reopens 18 months later. d) Olympic Park Pass: This is ideal if you only want to get inside the Olympic Park for the atmosphere, not the sport. Alas, expect ridiculously few of these to go on sale, no more than a few thousand a day. » Your tickets are being sent to whatever address LOCOG had in their system on February 6th. If you've moved house since, bad luck. Royal Mail will still attempt delivery to your old address, and only your old address, unless you've previously set up a redirection service. » Anyone at the designated address can sign for your package. That's probably good news... unless you've moved house since, in which case it's very bad news. » Royal Mail will send email notification on the day your tickets are due to be delivered. But there'll be no earlier warning, so you won't be able to rearrange your schedule to be at home that day. » If you're not at home when the tickets are delivered, they go back to your local sorting office. You can arrange redelivery, but only to the same address. After 18 days at the depot your tickets go back to LOCOG. Once they've been returned, you can only pick them up at a London 2012 ticket office. These will be open at venues at Games time, including on the day of your event. » Only when your tickets arrive do you finally discover which seats you've been allocated. A list of seating plans is available here. If you opted for the cheapest tickets, don't be surprised to find yourself in the cheapest most far-flung seats. It has to be said, the entire London 2012 ticketing system has been opaque, perverse and seemingly made-up by the organisers as they went along. Deadlines have slipped by months, understandings have entirely altered, and the actual sizes of ticket allocations have been suspiciously concealed. The whole enterprise has done nothing to engender feelings of fairness, that's for sure. But if you still fancy taking part, this week's your best chance to mop up what's left.